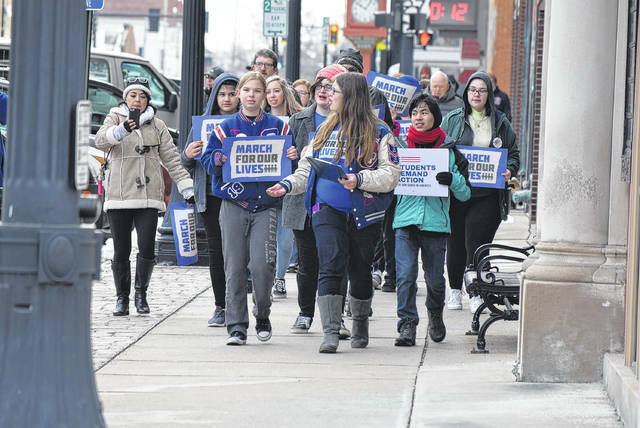 Hannah Bouillon, a junior at Crestivew High School in Convoy, organized the Van Wert March for Our Lives which began at the YWCA and went through the downtown to Fountain Park where a rally was held. Marchers gathered in Lima’s town square for the March for Our Lives, a protest against gun violence. 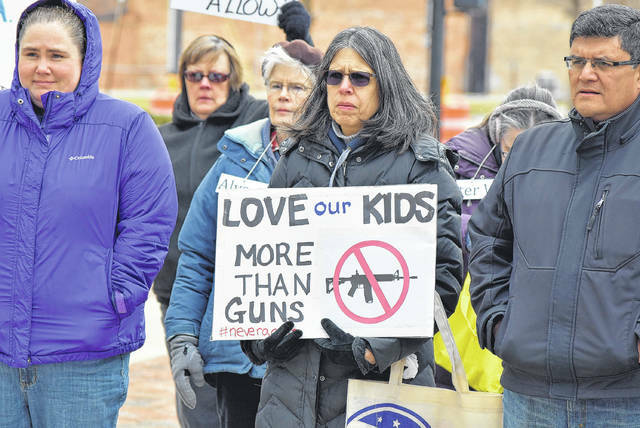 VAN WERT — While crowds were gathering in Washington D.C. for the March for Our Lives, smaller demonstrations took place across the nation Saturday. At 10 a.m., about three dozen people marched from the Van Wert YWCA to Fountain Park as a way to draw attention to the need to tighten the nation’s gun laws. The March for Our Lives in Washington was a direct result of the Feb. 14 Parkland, Florida massacre where 17 students and school personnel died in one of the worst school shootings this nation has ever seen. “After the school shooting, I would see on Facebook all of the hate that was being spread and just all of the arguments between sides, and I wanted to have a rally. I wanted to focus especially on just having a mature discussion and keeping awareness of the situation that’s going on, because I don’t care what someone believes as long as they believe something. Apathy is not going to solve the problem, and we just need to have an honest discussion and stop demonizing the other side,” said Hannah Bouillon, an 18-year-old junior at Crestview High School and organizer of the Van Wert March for Our Lives. Bouillon believe there needs to be more done to make schools safer. “I’m from Crestview, and after the shooting at Florida, a few days later, we had actually a shooting threat at Crestview. So we went on a three-hour delay, and we had a large police presence there, but a lot of the students were still scared, went home early. Even weeks after, people are still nervous to go to school, and kids shouldn’t have to be afraid to go to school,” she said. A similar event was held in Lima at 1 p.m. with marchers going from Town Square to the Allen County Courthouse. The event was organized by Tristam Cheeseman, a student at Bath High School who is also a campaigning for Ohio 4th District State Representative as a Democratic Party write-in candidate. “I’m still a student at Bath High School. My school district already had one threat after Parkland. My father’s school district [Shawnee] had a threat. Van Wert had a threat, and so this is a real issue and for me. It’s protecting the lives of children so that they can go to school safely and not think ‘I might get shot today,’” Cheesman said. Isabella Smith was one of several speakers during the Van Wert event. “I shouldn’t be afraid to go to school. I feel like a lot of the older generations don’t really understand what we’re going through because when they were in school, this type of thing didn’t happen. We’ve had threats that have been taken seriously and we don’t know if they’re legit or not. We’re having school cancelled and people are having breakdowns in class because they think that someone’s going to come in and kill them. We shouldn’t have to be dealing with this kind of thing,” said Smith, 14, a freshman at Van Wert High School. “The rally isn’t about just gun control, but my stance personally is that we shouldn’t take all guns away, necessarily. But we should have more regulation so that guns can stay in the hands of good people, but not get in the hands of bad people as easily and not be as powerful so that can’t just mutilate bodies so quickly. I don’t want to take all guns away. I just want more common sense gun laws so that people can’t go out and buy a gun that are not mentally fit,” Bouillon noted. “It’s important to bring notice to this issue and to show that the nation is no longer going to tolerate this. We don’t live in a third world nation where we don’t have a government or something. We live in a nation with a well-functioning government that can make the laws to keep this from happening. Part of it, too, is to show that the people are more powerful than the organizations like the NRA [National Rifle Association] that [believe] they can do whatever that they want. They can try and squeeze money out of us they can try and bribe our elected officials, but they’re just an organization. They can be beat by the American people,” said Cheeseman at the Lima March for Our Lives.